These aren't a particularly popular cut of meat in our area which actually works out well - it keeps them moderately priced. 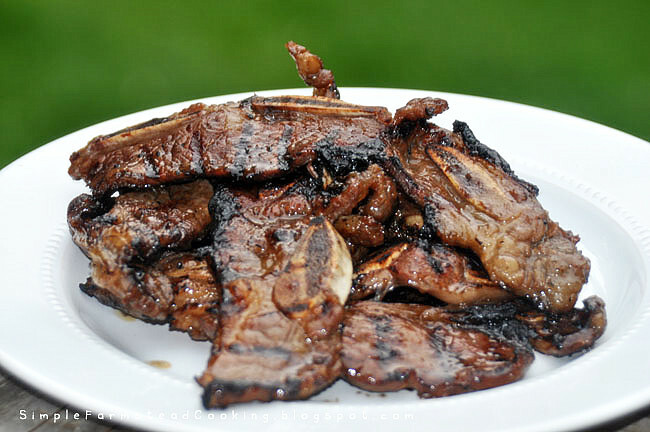 The Korean-Cut rib is a beef short rib cut across the bone. They are simple, quick to grill and finger-lickin' good. A warning - the marinade has a lot of sugar from the honey so watch for flames while grilling. Combine the honey, soy sauce, sesame oil, red pepper and garlic in a medium bowl. Mix well. Place the ribs in a large container with lid or resealable bag and pour in the marinade. Seal. Make sure the marinade coats the ribs then refrigerate overnight. When ready to cook, preheat the grill to high. Remove the ribs from the marinade and discard the marinade. Grill the ribs over direct heat until golden and crisp, about 3-4 minutes per side. Remove from the grill and season with salt and pepper to taste. Serve immediately.